"My inspiration comes from the natural world around me, such as the texture of tree bark, the fluid lines of a flowing river, flowers, and leaves." "My full name is Sainamphung Chuntakowsol, but everyone calls me by my nickname, Ying. I'm the second of four siblings, born and raised in Bangkok but always pining for Chiang Mai, where my father and uncle worked. When I finished college, I didn't think twice and moved to Chiang Mai, making my dream come true. "At first I started working as a designer of decorative items, but after a while I fell in love with Lanna, symbol of northern Thailand's culture and way of life. I studied all I could, and absorbed their way of thinking. Now I feel as if I've always lived in Chiang Mai. 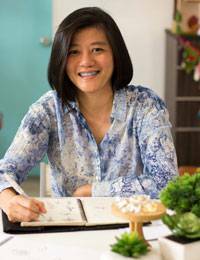 "After a few years' experience in my family's silk venture, I asked my other siblings, who still worked in Bangkok, to move up to Chiang Mai so we could start on our own. That was in 2001, and I was again working as a designer. 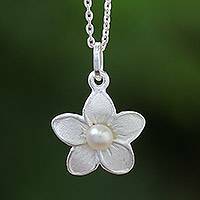 "In 2006, we decided to diversify and explore the realm of silver jewelry, because we believe in preserving the silversmith traditions of northern Thailand. Even though I didn't have any experience in jewelry design at the time, I was positively certain that we had the potential to develop great and unique designs that were based on different textures and shapes, and that we could combine them with the beauty of Thai silk. "I felt very proud to see how my first collection as a jewelry designer was well accepted. My inspiration comes from the natural world around me, such as the texture of tree bark, the fluid lines of a flowing river, flowers, and leaves. 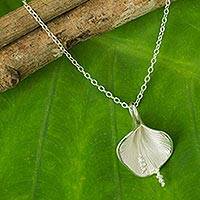 "As we grow and develop our silver collections, I feel happy with my designs and the talent of the silversmiths who help me turn them into original jewelry pieces. I still have a lot to learn and to create, and I feel so encouraged to see my designs go global. I feel very proud of the fact that I can now show the world the beauty of Thai design and the high quality work of Chiang Mai silversmiths." 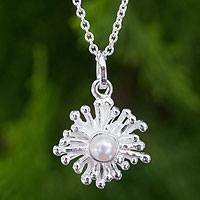 Sweet, simple design -- in lovely, lightweight silver. 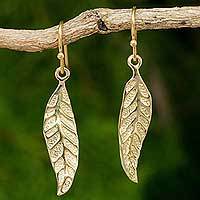 I love the delicate design of the earrings, the material is great, and the earrings look great with any clothes, and if you are not having a good day... this earrings will give the light you need ! I bought the Pearl blossom earrings as a birthday gift for a friend. They are very beautiful. Seemingly simple design, but with intricate patterns. I can definitely purchase more from Ying.